TRAP DESCRIPTION:This is our Small Hoop Live Trap. These are hoops with netting around them that are open on one end. This opening allows for turtles to enter. 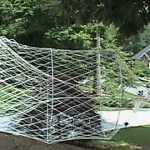 This small size trap uses hoops which are 30 inches wide and the net is a fine 1 inch wide mesh and is 6 ft. long. 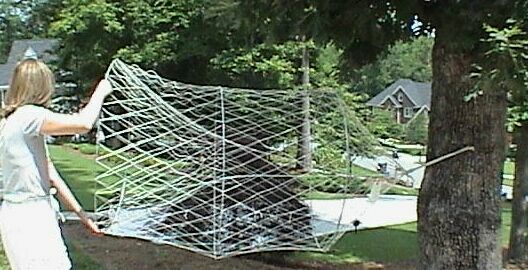 Bait is placed inside the netting and should be suspended or attached to the center hoop. The traps are then secured in water just at the surface and offshore with stakes. Turtles will move around the trap trying to access the bait and will eventually find the entrance. Once they enter, they will funnel through the first opening which semi closes behind them preventing exit. Trapped turtles can feed as well as breathe. This allows for multiple catches – as long as the trap has bait – and for successful relocation's. One of the big features of this trap is that you can make trap sets offshore and minimize non-target animals interfering with them – even when fish is being used as bait. Traps come pre-tied so the back anchor loop is properly adjusted. WHERE TO USE THEM: In bodies of water like ponds or lakes where the water is not moving, there is no "direction" the traps need to be set. However, when using them in rivers or streams, point the entrance Hoops downstream which means the turtles must swim upstream to enter them. Hoop traps can be used in ponds, lakes, streams and rivers. Basically any body of water which has turtles. RATE OF APPLICATION: It is important to use the correct size trap. The small hoop trap should be used when turtles are relatively small and range in size from a couple of inches to no bigger than 1 feet long. However the large hoop trap should be used when targeted turtles are 1-2 feet long. Like most live traps, the more installed will provide faster and better results.